This is proved by all the metrics, he noted, from 57 months of lagging job growth, wages stagnated to where they were 30 years ago, the ongoing opioid crisis where the state leads the nation in overdose deaths, or Ohio schools going from No. 5 in the country in 2010 to No. 22 in the country this year. The opioid crisis can be tied to the state taking money from local counties and cities that help fund opioid treatment to once again fund tax cuts for those who are already well-off. Pepper said that he has travelled across Ohio, from the plains of western Ohio to the hills of southeast Ohio, from the urban centers to the rural hollers, and no matter where he goes, people are frustrated and they share the same frustrations. All 88 counties in Ohio have these same bedrock issues in their communities, he said. More than that, they all have in common that the Ohio Statehouse has not only failed to solve these problems, but have been making the challenges bigger by taking local money. Pepper had kitchen-table conversations across Ohio after the 2016 election, in places like New Philadelphia and Steubenville, and he heard the same things there that he’s heard in Democratic strongholds in the cities. “The failures of the state are affecting these places more or less in the same way,” he said. Every statewide office is up for election with open contests in 2018, and in two years, the 2020 U.S. Census will lead to another round of redistricting that will decide state legislative and U.S. Congressional district lines for a decade. 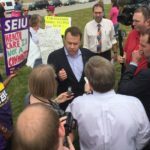 Ohio has been stuck with that since 2010 and it’s led to attacks on collective bargaining, the raiding of local government funding, and an unaccountable Republican-controlled state legislature. “In 2018, we have a chance to re-elect (Ohio Democratic U.S. Sen. Sherrod Brown). We have a chance to win the governor’s office. We have a chance to win up and down the ballot. And we have a chance to end gerrymandering so that for the next 10 years citizens actually have a voice in who leads their state and who they send to Congress,” Pepper said. In the last 50 years, when Democrats have held the White House, Ohio Democrats haven’t been able to win statewide, he noted. But when Republicans have held the White House, Democrats have gone on to win statewide in Ohio during every administration except the one term of George H.W. Bush, from 1989 to 1993.
Pepper said Ohio Democrats have good candidates, and praised Brown as a phenomenal person to have at the top of the ticket. Meanwhile, President Donald Trump is overreaching in a way that has activists and young people paying attention. Ohio leads the nation in student loan debt. Speaking before an appearance with the Ohio University Democrats, Pepper said that Ohio Democrats have to do a good job reaching young people, especially in 2018 because voter turnout by young people falls off particularly during mid-term elections. Pepper pointed out that Ohio leads the nation in student loan debt, saying that his is no accident and comes directly from state policy from Republican leadership that fails to prioritize public education and affordable higher education. Pepper said that he thinks that Ohio can send a real message in 2018 as a referendum on the Trump Administration. Pepper said he wants politicians to get that message too, like Ohio Republican U.S. Sen. Rob Portman, so maybe he’ll stop voting in support of Trump. That kind of rejection from Ohio in 2018 can send a message to the world, he said. If Ohio is the heart of it all, which Trump won by eight points, and two years later the voters go blue, people across the world will see the rejection of Trumpism. “It’s a historic role that we can play,” Pepper said.